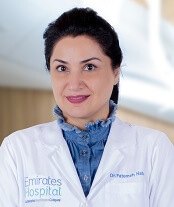 Dr. Fatemah Nabavizadeh has over 12 years experience in cardiology and joined the Emirates Hospital team in 2013. She graduated in medicine from the Iran University of Medical Science and trained in cardiology at the Modarres Hospital, Shahid Behesh University in Tehran, Iran. Dr. Nabavizadeh is a specialist cardiologist with expertise in echocardiography, carotid doppler ultrasound, stress test with treadmill and echocardiography, holter ECG, ambulatory blood pressure monitoring, preventive cardiology, female cardiology, heart failure, acute coronary syndromes, coronary artery disease, risk stratification of heart disease in patients with family history of heart problems and arrhythmia management. As well as hypertension and diabetes management. She has completed two fellowships in the USA: Echocardiography fellowship from the University of Alabama at Birmingham and a Transesophageal Echocardiography Fellowship from the Mayo Clinic, USA.